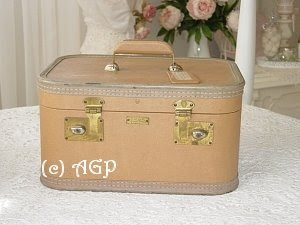 I’ve loved vintage luggage for as long as I can remember and first entertained the thought of refurbishing a Train Case back in the early 1990’s. 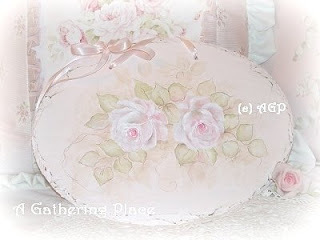 The idea came when I saw the cover of a craft magazine showcasing an old suitcase with hand painted violets. Back then I was always on the lookout for things to use as PROPS for my retail store…I actually never got farther than just base painting the exterior of a Case that truthfully was better suited for the trash! Still, the concept of taking something once highly sought after, (and certainly past it’s prime), and re-purposing it into something usable for today intrigued me. So, I banked the idea but knew that one day I’d return to the vault that stored all my dreams of restoration. 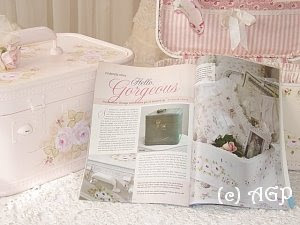 In September 2006 Romantic Homes Magazine showcased the very Train Cases that once had been only a passing thought (“Cinderella Story” called “Hello, Gorgeous”- written by Hillary Black). I couldn’t have been more excited when I saw my work in print! It’s taken me years to narrow down the BEST Cases and the ones to pass on! 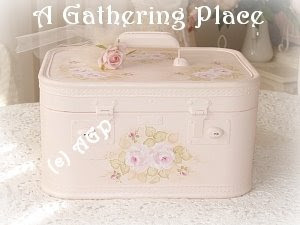 I’ve included a picture above of the first Case I ever gave a FULL MAKEOVER to (circa 2001). She is warped (that is what happens when you choose a Case that is NOT wood) and yellowed (used the WRONG kind of sealer), but I still love her! Normally reserved for special orders, I finally listed a newly refurbished Case on my website (first picture above). I hope you’ll check her out! Be inspired! If I can make them then I promise, you can, too! Talented women were all around me as a child and each one showcased a different artistic gift. I was so blessed to learn from each one and then live in a time when it was possible to sell my designs directly to the public. Had the Internet been available when I was a young girl my very talented mother would surely have used it as a way to help support her growing family. She remains the most gifted artisan I know. Learning to sew wasn’t difficult for me…I mean, it was at first, but somehow I just “got it”, you know? 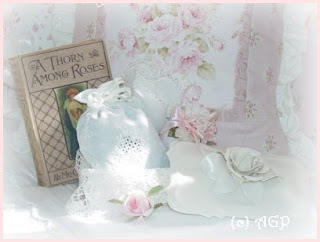 I began to sew on my own when I was about 18 years old and pretty much never looked back. Frustrating for me at first, but little by little I learned the basics. Later on I enjoyed sewing clothing for my daughter and it was during her childhood, I believe, I really hit my stride. I’m not sure my girl owned a store-bought dress! Truthfully, I couldn’t afford the ones I wanted her to wear. So, I’d spend hours window shopping in fancy children’s shoppes and then scour the local fabric stores to find similar fabrics to sew-up what I’d seen. When the dresses were outgrown I’d sell them to other young mothers in our church and then buy more fabric to make more dresses…. Her name was Laura and from as far back as I can remember she was there. Laura was a petite little thing, truly tiny. For years the two of us battled back and forth hoping to win the coveted title of “shortest girl in the class”. Secretly I believe we both enjoyed the grade school fame brought about by our questionable stature. I think we liked the teasing, too. At the very least we enjoyed being noticed for something certainly not notable. Her hair was golden yellow and easily framed the delicate features on her lightly freckled, pixie-shaped face. My hair on the other hand was seriously mousy brown and my nose and lips could never be considered, um…well…delicate. My mother did dress me up fancy though, and if anything set the two of us apart it was our clothing. Laura was a confessed “Plain-Jane” and I was a bit “Prissy”. Her dresses were the dime store kind and forgettable. Her socks were dingy white and more often than not her shoes were too big and overly worn. Evidence of an older sister, I suppose. Still, we were friends. And it was during those early years at Bixby Elementary we dared to dream the biggest of dreams while carrying the smallest of reservations. 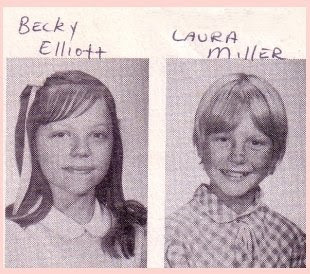 I remember best fifth grade, for that was the year we played “Barbies” for hours and the one and only time Laura was allowed to spend the night. We giggled until the wee morning hours, stopping only when my father came in to settle us down. FIFTH GRADE! The unforgettable year of Red Rover, Red Rover and the begging for my “best friend” to come over… It was also the year our classmate, Cindy, was bucked from her horse and died. The year we both learned of loss, experienced real sorrow and death. I remember how we cried…we were 10. I counted down the days until the yearbook arrived. She came wrapped in simple brown paper and had a return address which included my childhood hometown. 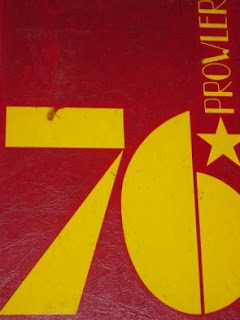 I carried the book into my office and began to tear away the wrappings, slowly, carefully opening her cover. She was in good condition. She'd been gently loved and cared for. I was actually nervous...even a little afraid some of my past might catch up with me. I quickly searched through a maze of scribbled names and sentiments, special keepsakes, endless photos and graduation calling cards for a hint at the identity of the yearbook's previous owner. 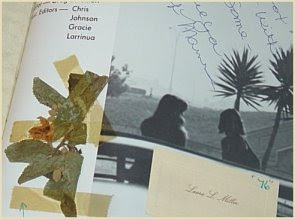 And then, just to the right of a carefully pressed corsage was a name I immediately recognized…Laura Miller. With a little help from a sweet high school pal, I discovered much about the life of my childhood friend. Laura indeed went on to have a very difficult journey. She endured more than her share of heartache and loss and battled things I can only scarcely comprehend. There were addictions, depression, and the inability to bear children. 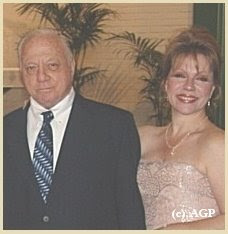 Finally, in the end there was the ovarian cancer that robbed her of breath in May ’08. She was 49. I cried for a bit when hearing of the news of her passing…more than a bit if you want to know the truth. Cried because we’d lost touch and grown apart… Cried because Laura’s life was so DARN HARD while mine had been fairly easy. Cried because I never took the time to find her or at least try and help her through some challenging times… Cried because I never cared enough to understand her difficult choices, her history, her heartache… Cried because I’d judged her too harshly…refusing to even acknowledge the beam in my eye while picking at the speck in hers. Mostly I cried because I never took the chance I'd been given to say “I love you” and “I forgive you”. Today I encourage you to bind the bruised and broken, mend fences, mingle memories, melt pain. Until we make peace with others, we’ll never be at one with our Creator. Now...don't you just hate it when you make all these grandiose plans for a day out of Estate Sale, Garage Sale, Thrift Store and Second Hand Shoppe shopping and it pretty much GOES BUST? Even though my Saturday excursion wasn't a total disaster, it certainly WASN'T the event I had hoped it would be. I was really wanting to purchase some small pieces of furniture! Anyway, this furthers my belief that sometimes you win, and sometimes you lose! More and more I believe it's the SALES you stumble upon while out doing something else, and NOT the ones you plan on visiting, that bring the most excitement! Don't get me wrong, I did return home after five long hours of driving and shopping with some wonderful old finds. I just wanted more...I always want more! The prices at two of the Estate Sales were rediculously high and I left both places with only a handful of precious vintage linens. The local resale shops proved to be the best place to uncover hidden treasures this week! I did manage to pick a few charming old finds though...the last stop salvaged the entire day! 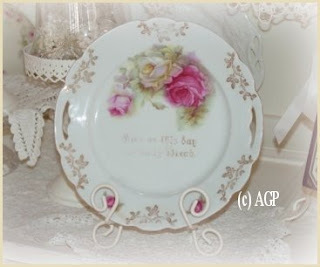 I found two sweet rose plates...my favorite being the one that says "Give Us This Day Our Daily Bread". Even though it's faded, it was a must have. 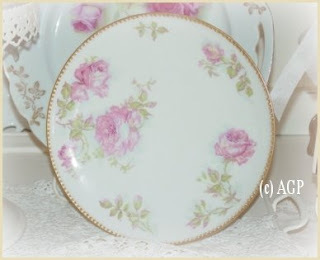 The second one is a hand painted beauty...my favorite, Limoge. I also dragged home a delightfully sweet metal Milk Jug w/lid, a fabulous crocheted coverlet ($10 bucks!) and two vintage wooden bread paddles for painting! A few years ago when our son was in the Air Force, my Mr. AGPM (A Gathering Place Man) and I took a trip up north to Omaha for a visit. On our jaunt from Oklahoma to Nebraska we stopped in some amazing places to shop...one place was Kansas City. I remember coming back home with an SUV full of wonderful treasures for our home! It was during this trip I found two decorative wall thingies (sp?) 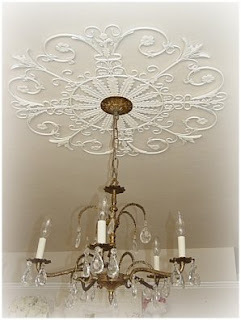 which I decided would be fabulous as ceiling/chandelier surrounds (or WHATEVER they are calling those things that go on the ceiling that light fixtures hang from)! Anyway, after a little work :) :) :) he transformed both the wall pieces and made them into chandelier accents for the ceiling! Since then we've mounted the surrounds in all the rooms in our home (all different styles and sizes). They are GORGEOUS and much less expensive than the "real ones" sold at a Lighting Store! Think ROSS, TJ MAXX, MARSHALLS, HOMEGOODS, etc. I see them all the time! Tomorrow is Estate Sale Day! I'm off to dream about the goodies I'm HOPING to snag by being FIRST IN LINE! I'm getting out early! Whooo Hoooo! A few years ago I had the pleasure of meeting the most wonderful lady! 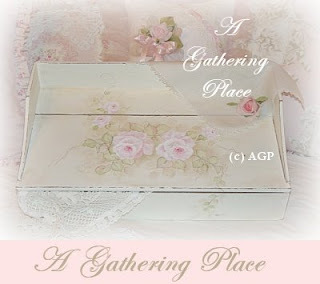 She found me through an article published in Romantic Homes Magazine and contacted me about placing an order for a refurbished vintage Train Case (“Gathering Case” TM). The Magazine had done a photo shoot in my home and had included pictures of my artwork. I didn’t realize it then, but this "Pink-Rose-Lovin'" stranger was destined to become my forever friend. I believe God sends people into our lives to make our journey on this planet easier. I also believe they come when least expected and quite possibly when least deserved. My fair-haired friend easily and quickly satisfied a void in me that only a true friend could fill. Never judgmental and forever kind, in three short years she’s taught me the bonds of sisterhood can often transcend the closest of bloodlines. She’s been a faithful servant to the Most High; a cheek turner and a confidant. When she forgives, she forgives! The transgression is buried in a sea of forgetfulness…never allowing the curtain of darkness to hide the very light that one day may be called upon to illuminate her own path. Living in Oklahoma certainly has it’s perks though (like LOWER Real Estate Prices)! Still the reddish-brown earth remains stone-cold-hard and at present, it’s refusing to give birth to even a hint of color… Occasionally one might see a patch or two of blooming something-or-other, but truthfully, even the professionally landscaped gardens are looking a bit peaked. Pursuing beauty, whether in the garden or within the home, invites us to escape from our hectic and fast-paced world to a place where even the simplest of pleasures leave us rejoicing! 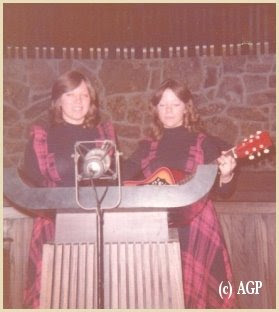 I believe I must have been about four years old when first paired with my sister Linda to sing duets. 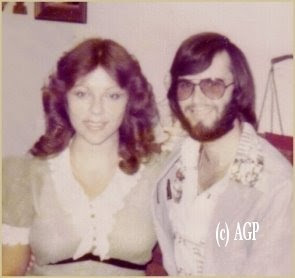 She was two years older than I and I distinctly remember the two of us standing side by side, just to the right of our mother as she sat and played our Gulbransen piano. Two peas in a pod we were. We’d learn the songs set before us and often be expected to sing one the following Sunday. 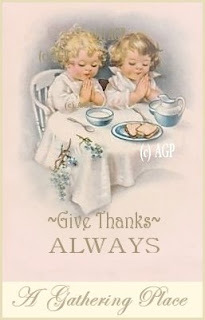 Such was the life of two PK’s (Preacher’s Kids) and trust me when I tell you this was the norm. I even recall on a few occasions singing with our mother. But that was back when we were very, very young and long before her ears were silenced. And so began my passion for singing. A desire birthed within me when just a little girl and one that has grown during many days of living life on this planet. Uncovering the “sound of song” is in me…it just is! And, not unlike my love for both painting and sewing, it has successfully knitted itself into the very fabric of my heart. One of my greatest joys comes from singing with my hubbs. But, knowing I’d be going it alone on this one given Sunday prompted me to look particularly hard for something fresh and moving. I attend a loving church filled with precious people. But, we live in a hurting world and if you take the time to look you will see much suffering. I asked God to lead me to the right song…the song He wanted me to sing. Just a quick POST today! We are venturing out on the estate sale circuit (my favorite thing to do on Saturday) and I'm already running behind. Imagine that...me being late for something!? I'm afraid my hubbs has grown use to me being tardy for EVERYTHING! 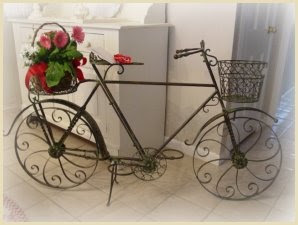 When I woke up this morning I found this beautiful Bicycle Planter in my breakfast room. The back basket held a special arrangement of beautiful flowers and on the seat were two cards (one serious and one funny) and my favorite cheap candy, a Russel Stover's Strawberry Cream Heart. Now, don't get me wrong. I love roses and dinner out, Godiva Chocolates, diamonds, etc. Roses will forever and always be my favorite flower (not red, but soft pink) and who can resist and bit of BLING or a decadent treat now and then? It's just that for ME I've longed for something different. I mean, the roses I see growing in my garden are truly my favorite (can't wait for them to bloom) and of course anything that comes "special delivery" (and on no particular day and for no particular reason) takes my breath away~ After many happy years of marriage I still love it that my hubbs comes up with his own definition of ROMANCE! Take this charming Planter for example. 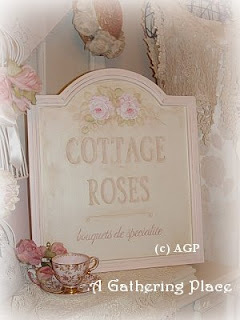 I saw it about a month ago at Tuesday Morning and I sooooo wanted it for one of my front flower beds. But, even their "off-price" price tag was too high for me and so I passed it by without saying a word. My AGPM (A Gathering Place Man) must have noticed me eyeing it because he commented on it's unique style and form. I only smiled as I ran my fingers over the handlebar and walked away. He listened and watched...has grown accustomed to the look of wanting on my face and read it like a favorite book. "All the wealth in the world cannot be compared with the happiness of living together united." When I was a little child my father always bought me chocolates for Valentine’s Day. Not the expensive stuff…on a part-time preacher’s salary (which was truly close to NOTHIN’) he couldn’t afford much. Still, every year he managed to give me and my three siblings something special. I looked forward to my father's tiny-sized offerings of love... generally a four piece box of Whitman's Chocolates accompanied with a Valentine of my very own. As I got older I easily grew accustomed to his meager gifts and as the years passed I even took them for granted. A lot for granted. And, then one day, they just stopped coming. all that has been ripped from his life. It's the one mercy of the disease, I suppose. It was then I pulled out from it’s hiding place a tiny box of Cherry Chocolates and a little heart shaped Valentine and placed them in my father’s aging hands. Suddenly it didn’t matter if he remembered the past. I suppose in many ways, this little note to you is way overdue. I should have made time to pen these thoughts to you many, many moons ago. Regrettably, I’ve allowed years and years of busy days and hectic nights to pass by without reassuring you of my constant love, ever growing respect and admiration. It is you I love…only you…forever you! Always and forever you will be my Valentine. I believe you are a true “Giver”. I’ve never known anyone who can match your generosity in time spent or in money given or love shared. It is important to me for you to understand that even if no one else ever notices how big your heart is, I do. I suspect we both will be long gone before either of our children will fully understand the depths of your love for them. I’ve never known a person to work so incredibly hard and yet require so little in return from those who claim to love them. You have set the mark of selflessness beyond the reach of all of us. I feel ashamed that my restless heart will never equal yours. In over thirty years of marriage I have often failed at being all of what you deserved and I can only pray that if blessed with another thirty I’ll be afforded the chance to repay you for all the kindnesses you have bestowed upon me. I want you to know that I believe you to be the best father and husband in the world. Your work ethic and your commitment to the success of your children remains unequaled. Your faith in me has been nothing less than inspiring. Your love and devotion to the three of us, even when it meant giving up on your own dreams, convinces me that you alone are worthy of everything good…everything lovely. Looking forward to more “us days” and sharing my heart with you…"
We survived the tornadoes that hit Oklahoma AND our town last night! I am SO GLAD this latest weather related nightmare is over! Our house escaped damage but many homes weren't so fortunate! Today, I'm thankful the devastation wasn't any worse than it was...it's bad enough! A few years ago one of our towns was nearly destroyed by a similar storm. There were people who did lose their lives last night...I believe the death count is currently at eight. It was a serious storm and I'm grateful it is over. Loving thoughts and prayers go out to those who are facing any loss... We are a strong people here in Oklahoma! Thank you for all the emails and BLOG comments! They mean so much! I did manage to get some things uploaded on my website before the weather turned severe. This proved to be nothing short of amazing as half the evening (and then some) was spent without power! When it did come BACK on it went off again almost immediately... So much for the plans for my Website GRAND Re-OPENING! Isn't it funny how you can plan and plan for an event and then something BIGGER than you are changes everything in a flash? Not to worry though! We are GREAT and like I said, we survived the storms! Blessed and sooo thankful to be alive. 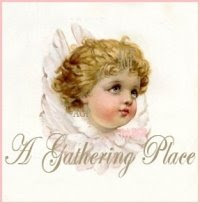 I will continue to upload new items for your consideration on my Website! 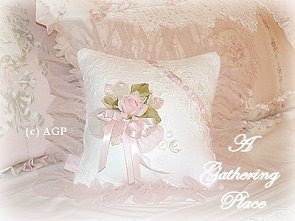 Don't forget to post a comment so you can be entered in the drawing for the FREE SACHET PILLOW~I'll ship it anywhere! Still have so much to get ready for you to see! Thank you for the biz and AGAIN for your heartfelt words of encouragement and concern for both my family and I AND the beautiful state of Oklahoma! They mean more than you know! We aren't 100% sure yet but we BELIEVE the worst part of the tornadoes have passed us by. My town (Edmond, OK) received damage just north of us...very scary! A few houses are destroyed and the roof is off at a local TARGET and a pizza place (Chuck-E-Cheese)! Power lines are down as well! For those of you who aren't familiar with tornados...well...it is pretty frightening! I'm from California originally...so I know all about earthquakes, too! At least with a tornado we get some warning... All of it is equally disturbing and again, SCARY! Presently we still have LOTS of rain and thundering storms. Just a warning we may have to shut everything down again... :(. A tornado just touched down near my home. I'm off for now...I'll post more soon! I'm not even close to getting everything photographed and discriptions written for the Website! I've decided to keep working and upload what is ready sometime tomorrow instead of delaying the opening! I still have hours of work ahead of me and terribly underestimated how long it would take me to get everything finished! I'm also having quite a time with my aging camera and it's making me hate myself for buying something so advanced when I'm so incredibly TECHNO-challenged! Trust me when I tell you we are working non-stop on the Site! If you are a FOLLOWER your name will be automatically entered twice for the DRAWING! If you place a COMMENT it will be entered a third time! You have a chance to have your name entered three times!!!! Off to work…paint…sew…and maybe dream about getting a FEW HOURS OF SLEEP! For the past few days I’ve had my face stuck in my paint box and I haven’t been listening to the news nor have I paid much attention to on-line business chatter. 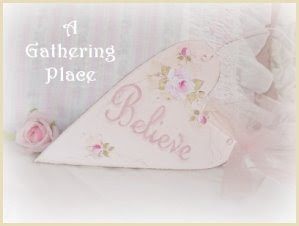 The result of my personal preoccupation was that I was blindsided by the news that Rachel Ashwell’s most beloved Company, Shabby Chic, filed for Chapter 11 Bankruptcy protection last Thursday. I’m just going to tell you straight out that I’m heartsick. I really am… This Flea Market lovin’ gal, blazed a fiery trail that helped jump-start many of the businesses you see in operation today…including mine. From the largest Department Stores to the tiniest of On-Line Boutiques, we benefited from her incredible vision. If not inspired by her success, many of us certainly traveled for free as we clung tightly to the hem of her lace-trimmed coat tails, hoping against hope we might also find personal triumph and victory along the way. On a tremendously smaller scale I can sadly relate to the sorrow brought about by the closing of a deeply loved business. I faced the same decision in the mid 1990’s so I can truthfully say I’ve been there. It’s not a pleasant place to find oneself and crawling out of what I’m quite sure looks like a deep, dark hole, will be challenging. May God be with you during these difficult days of change, Ms. Ashwell. May His comfort surround you and encourage you as you press forward through the storm! The God who first blessed and anointed your dream is more than capable of doing it again…and again…and again! So…as I thought about Susanna and her faith I couldn’t help but wonder if I prayed enough for my children when they were little…or more so, pray enough for them now that they are grown? Asking myself that question also gave me the answer…. 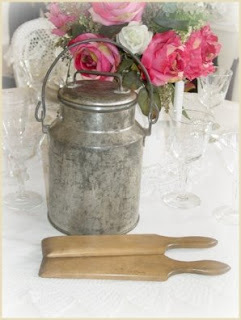 Over the weekend I went shopping and uncovered a treasure trove of simply amazing finds. The best purchase of the day was a charming old Lap Desk found at a local Thrift Shoppe. I believe it hails from around the 40’s to 50’s! With great pride I carried my treasures inside for my Hubbs to inspect. He quickly gazed over a few familiar looking finds, but paid the most attention to the Box. Just a quick note today for all of you who are waiting for the GRAND :) Re-Opening of my Website~ http://www.gatheryeroses.com/. I'm shooting for the 10th of February as OPENING DAY! I promise to post updated news later this week and share more about the fabuloso FREE GIFTS I'll be offering to celebrate! Stay tuned...pretty finds that are sure to pull at your HEARTSTRINGS!